The price of gold appears to coincide with an increase in consumer apprehension about risk of their investment portfolios. 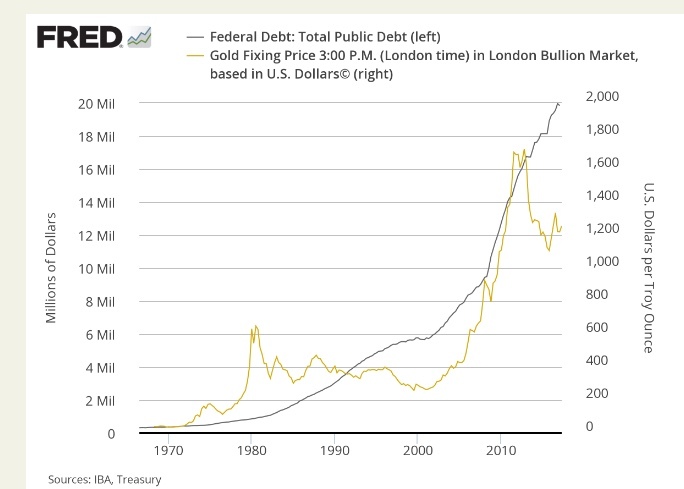 However, peaks in the price of gold do not coincide with stock market recessions and therefore gold must be considered as a form of insurance, not as an investment. 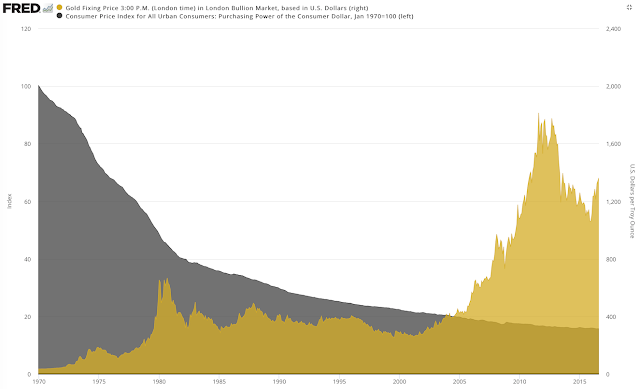 The years that followed the dramatic decline of the stock market after the 2007 recession showed up as increases in the price of gold as investors were seeking better places where to place their holdings. After 2009 a steady gain in profits from other investment opportunities reduced investor anxiety to keep gold and therefore priced it at new high levels from $1,200 to $1,300 which was well above the historically low levels from 1985 through 2005 but insufficient for making further gains. One can conclude from such a pattern that the price of gold does not appear reflect the underlying medium term economics of profitability of businesses of 10 to 20 years. Gold can be therefore viewed a safe repository for long-term cash assets. Gold market fluctuations reflect the psychology of large investors who can afford waiting for distance gains while retaining the safety of a part of their holdings. 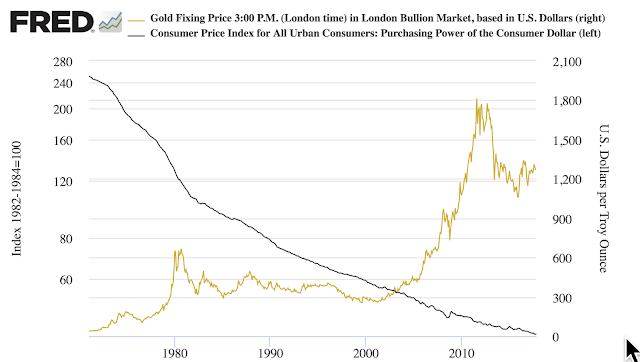 As the consumer price index declines, the price of gold remains at the same levels for over 20 years. The, suddenly in year 2000 the price of gold rises sharply only to decline in 2005. It is then apparent that gold cannot be considered to be an inflation hedge, although this idea is one of the most frequently pronounced theories. The tendency of long-term holding of gold is also reflect in the next chart which show correlation between the Federal public debt and the price of gold. 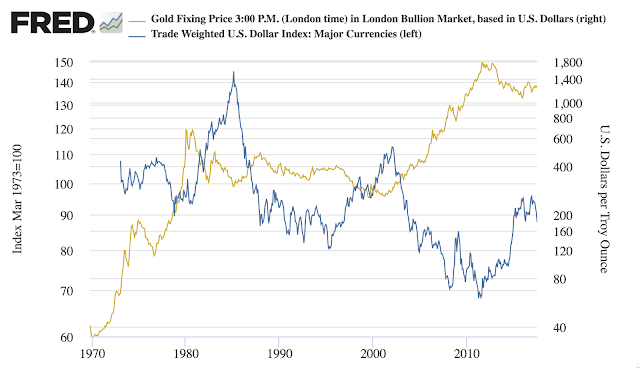 The large gains in gold price in 1980 and in 2010 reflect spurts of gold purchases that can be interpreted as a reflection of the "animal spirits" of large investors and of scared small investors. It appears that a relationship may be forming between major currencies, as measured by the dominant US dollar index and the price of gold. The large decline of the dollar in 2008-2012 is reflected in the rise of the gold from $300 to $1,800. The correlation of the price of gold and inflation also appears to exist as shown in the following graph. It took a large decline in the consumer price index for gold to be recognized as an inflation hedge. The consumer price index declined steeply from 240 to less than 55 before the price of gold increased from $300 to its peak of $1,800 only to come to a rest the current level of $1,200. It follows that gold should be seen differently than other stock market investments. Its gyration in price could be perhaps best explained by changes in investor anxiety and sentiment rather than anything the represents a part of a retirement portfolio that is based on the profitability of its equity holdings. Gold should be therefore kept as insurance that may not necessarily appreciate in the lifetime of a person. Gold should be held for a long time as a back-up or as diversification for surplus cash would not be needed except under unusually stressful circumstances. Gold cannot be classified as a retirement investment for someone with only adequate wealth. For retirees gold should be only seen as a safety back-up when a large depreciation in currency ever occurs. As the prospects of an every increasing prosperous future for US holders of retirement wealth occur, gold may nevertheless emerge again as a way of preserving income under risky economic conditions.